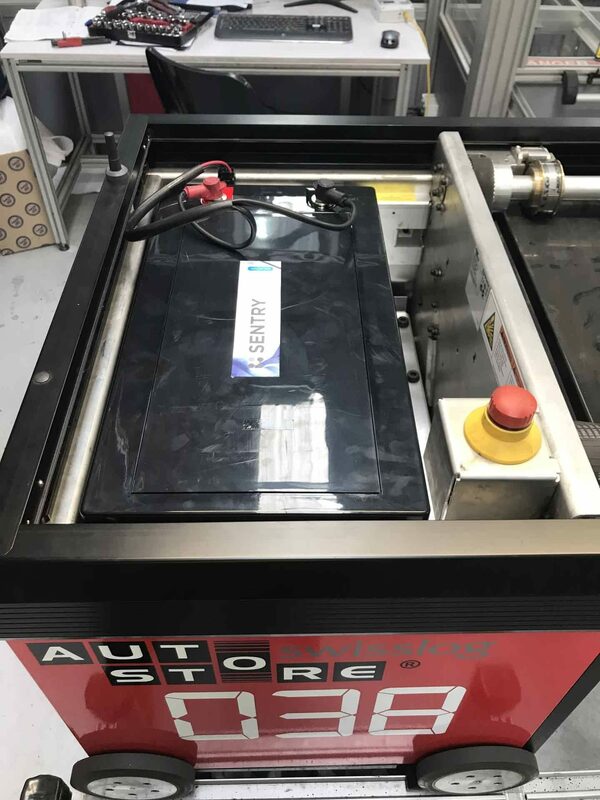 When Australia’s premier eCommerce superstore, Catch Of The Day, needed an innovative long-term solution to their picking and packing productivity, they sought out the expertise of another leading Australian company – Sealed Performance Batteries, the wholesale specialists in batteries and energy storage solutions. Catch Of The Day’s multi-million dollar distribution centre at Truganina in Melbourne’s outer west is a state-of-the-art warehousing facility designed for maximum efficiency to pick and pack more than 500 order lines per hour. To meet the requirements of this demanding workload, a fleet of seventy-two Swisslog robot carts are used to automate the process. A programming station controls the robots wirelessly, mapping the most efficient path for them to fulfil orders. However, with Catch Of The Day’s rapid top-line growth, the robot’s existing batteries – 2 x 12V100AH SLA’s in a 24V configuration – were struggling to meet the ever-increasing daily order targets. With Catch Of The Days’ eight hours shifts scheduled twice-daily, and a robot’s operational capacity limited to six hours before it needed recharging, the decline in productivity was increasingly evident. An eight hour charge time for their existing SLA batteries meant a robot was out of service for at least one shift per day. Compounding efficiency and cost-effectiveness was the need to replace the batteries in each robot every 12-18 months. It was at this point Catch Of The Day’s young gun maintenance engineer, Luke Scott knew there must be a better solution, it was either spend more money on new robots, or find an option to increase the uptime of the existing Robots which led Luke to start his investigation into Lithium as a battery option. Subsequently a trial was conducted whereby a robot was fitted with a single Sentry Lithium 24V 150AH LiFePO4. The results were outstanding, with the lithium-powered robot’s new operational capabilities extending to a run time of six full shifts before requiring a recharge, which could then be undertaken during the four hour period where Catch Of The Day does not operate a shift. This effectively reduced the downtime of each robot to zero (an increase in productivity of 285%), and with the 10 year lifespan expectancy of each Sentry Lithium battery, replacement times have been reduced by more than ten-fold against SLA replacement, resulting in a saving of greater than $281,000. Catch Of The Day estimates the overall dollar value of their improved productivity to sit around $126,000 year. With such successful outcomes, Catch of the Day’s lithium-powered future only depended on insurance to cover their warehousing facility before they could move forward with a full retrofit of every robot. However, with standard safety requirements to be met, Catch of the Day’s insurance provider required a full safety report, along with independent testing certification on the complete battery system. Sealed Performance Batteries offer a range of lithium batteries across leading brands such as Sentry and Leclanche, each containing contain built-in battery management and monitoring systems to advance the productivity, efficiency, and economy of residential, commercial and industrial applications. With their trademark personalised service and specialist product knowledge, Sealed Performance Batteries can assist with battery products or energy storage solutions for any application, across every industry.